If winning at Talladega Superspeedway, NASCAR’s biggest and baddest race track, isn’t enough, four drivers will have even more incentive – and 100,000 reasons – to claim their first triumph at the 2.66-mile track in the MoneyLion 300 NASCAR Xfinity Series race on Saturday, April 27. 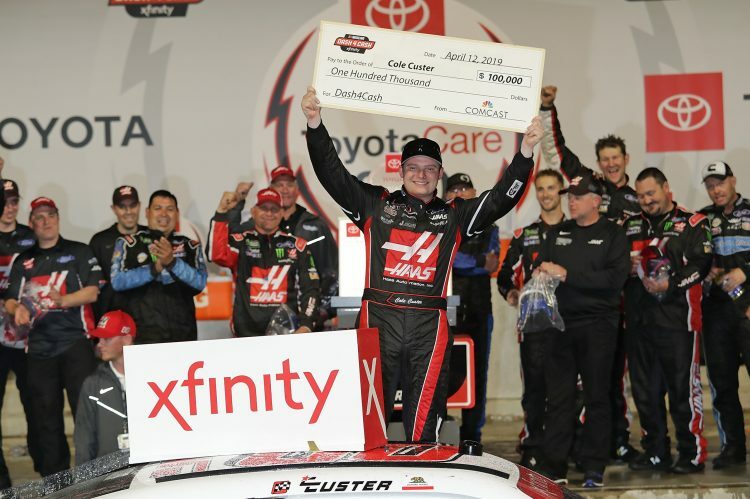 As a result of being the highest eligible finishers in last weekend’s NASCAR Xfinity Series (NXS) race in Richmond, Cole Custer, who won the race, along with Austin Cindric, Justin Allgaier and Tyler Reddick, will now make the trek to Talladega with a shot at the Dash 4 Cash program, which awards a $100,000 bonus to the highest finishing NXS regular in select races. The Dash 4 Cash program started at Texas a few weeks back and has since been at Bristol and Richmond before moving to Talladega and concluding at Dover. Custer: The 21-year-old driver of the No. 00 Ford for Stewart-Haas Racing is in his third year competing full time in the NXS. He will be making his third Talladega Superspeedway start in the MoneyLion 300. Custer’s best NXS finish at the 2.66-mile venue is ninth a year ago. In eight starts this season, the Ladera Ranch, CA native has two wins and has posted five top-five results. He sits third in the title standings, 29 points out of the lead. Custer was in Birmingham last week promoting the MoneyLion 300 via racing go-karts and axe throwing with media. Cindric: The 20-year-old Columbus, OH native is the driver of the No. 22 MoneyLion Ford Mustang for Team Penske. After a successful rookie campaign a season ago where he finished eighth in the title standings, Cindric sits fourth (63 points behind) in this year’s battle with three top-five finishes. At Talladega, he will be making his second NXS start (finished 30thlast year) but fourth overall. In two NASCAR Gander Outdoors Truck Series TSS races, he posted fifth in October 2017. Team Penske has two NXS wins at Talladega. Allgaier: The veteran of the group, Allgaier, 32, pilots the No. 7 Chevrolet for JR Motorsports. In his ninth full-time season in the NXS, Allgaier has three third-place finishes in the season-long championship. At Talladega’s mammoth venue, he has eight starts in the NXS with a runner-up finish in 2016, along with six top-10 efforts. He does have a victory at ‘Dega, coming in the 2008 ARCA event. A winner of 10 career triumphs in the NXS, the Riverton, IL native is fifth in this year’s standings with three top fives, and 87 points out of the lead. JR Motorsports has been strong at NASCAR’s Most Competitive track claiming two triumphs. Reddick: After winning the 2018 NXS championship for JR Motorsports, he made the switch to Richard Childress Racing (RCR) in 2019. So far, so good, as he leads the standings with six top-five and seven top-10 results in his eight starts, although he is still searching for his first win of the season. The 23-year-old, Corning, CA native has two starts at Talladega with a best eighth-place effort a year ago. In three Gander Truck events, he had a fourth- and fifth-place result at Talladega. Reddick has shown he is a fine restrictor plate racer, winning the season-opener at Daytona in 2018. While RCR is winless in the NXS at Talladega, the team has won a record 12 Monster Energy NASCAR Cup Series races. The MoneyLion 300 gets the green flag on Saturday, April 27, at noon CDT. The action-packed weekend is loaded with an array of activities for fans, both on and off the track. Saturday’s slate also includes afternoon qualifying for the GEICO 500, which is set for Sunday, April 28. Children 12 and younger gain FREE admission for Saturday’s events with the purchase of an adult grandstand ticket starting at $45 or tower ticket at $55 (before next week’s $5 race week increase). The weekend begins on Friday, April 26, with the General Tire 200 ARCA Menards Series race, along with practice sessions for the MoneyLion 300 and GEICO 500. Kids 12 and younger receive FREE admission on Friday.